Stormzy will appear in the BBC's adaptation of Malorie Blackman's novel Noughts + Crosses. The grime MC says it's a "dream come true" to be involved. He will play newspaper editor Kolawale - a new character created for the show, which is currently being filmed in South Africa. The 2001 book is set in a world divided by race, where black people ("Crosses") are the rulers and white people ("Noughts") are the underclass. It's the first of a series of four books, with a fifth to come out this summer. 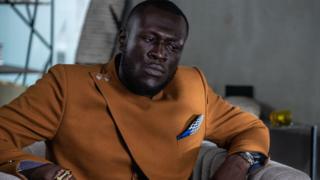 Stormzy says he's "a diehard fan" of his "childhood hero" Malorie Blackman's novels, and he called Noughts + Crosses an "important show". The 25-year-old rapper will perform at Radio 1's Big Weekend in Middlesbrough in May and Glastonbury in June. He's teased new music, telling Radio 1 Newsbeat in November that he's been "locked in the studio". The Croydon-born artist released his own book last year, co-authored with Jude Yawson - who he got in touch with back in 2014 after reading something Jude had written about him online. He's also partnered with the publisher Penguin Random House to create #Merky Books, which aims to help young writers become published authors. She's also written for the latest series of Doctor Who.